Do you want to know more about the United States? Do you want to be able to talk with Americans knowledgeably about the U.S.? Do you want to know how the U.S. government works? "Introduction to the United States” is a course that answers your questions about the United States in a new and exciting way. 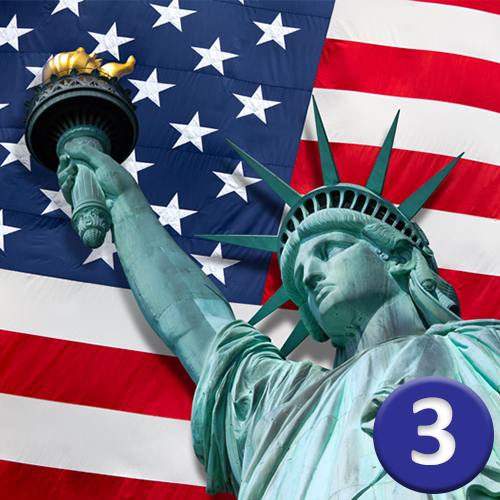 This course uses some of the 100 questions from U.S. naturalization test, the test that people take to become a citizen of the United States. It focuses on how the U.S. was formed and how it works, who the important people are in its history and in the current government, and the different parts of this very big and diverse country. Each question is divided into three parts. You will first hear the question read, then the short answer, and then a longer explanation of the topic. The longer explanation has built-in definitions of new terms and phrases, so you will understand it just by listening. You will listen to the question-answer-explanation first at a slow speed, and then again at a normal rate of speech (fast). In this course, you encounter the important key vocabulary several times throughout the course, helping you really understand the meaning of the terms and expressions, and how to use them correctly. Get the most out of “Introduction to the United States” by following along with the Learning Guide, which has a complete written transcript of every word spoken in the lessons. All of the vocabulary and expressions used in the lesson are also listed and defined in the “Glossary” of the Learning Guide, giving you the opportunity to read and review whenever you’d like. Plus, you are provided with an extra sample sentence using the word correctly in context. Finally, you will receive a BONUS “Index of Glossary Terms,” which lists all of the glossary terms and their definitions from all 100 questions, with easy reference number listed so you can easily find the question(s) where they appear. By listening to and reading each lesson, you’ll have a truly powerful way to increase your skills in English.